For your local business move, coordination and planning can make an incredible difference in the amount of down time, costs and overall impact that comes along with moving a business. Hiring an experienced local business and office mover will ensure that interruptions are minimized, and your business gets back up and running fast! Work with our professional teams for a free custom business moving quote, planning best practices and industry leading moving expertise. Moving a business, even if you are just going around the corner or the next town over – can be an expensive feat. Not only does a business owner need to calculate the actual costs to move, but then additionally needs to consider the costs of the business being out of commission until everything is settled into the new location, which can include lost sales, lost employee wages and more. With Moving Ahead Services, we know the faster you are at your new location, set up and back in action – the less interruption and money lost and the less down time incurred. Our commercial divisions in Cleveland and Columbus coordinate with your schedule, to ensure that the move is planned for your least busy operating days, and to be completed as efficiently as possible. Hire our professionals to pack, load, transport, unload and set up your new office – or simply for loading and transport services from point A to point B. We have completed thousands of business and office moves, both large and small, as well as a variety of other commercial moves for dental and doctor offices, machine shops, gyms and more! Put our experience to work for your move today. Schedule your move with Moving Ahead Services, start with your free, custom business moving quote and our office packing guide today! Start your business off on the right foot at your new location, and minimize the stress and impact of the big move. Expert residential and office movers serving Ohio and beyond. 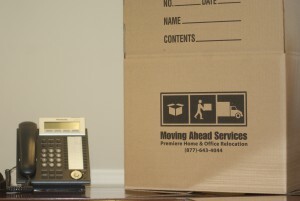 Local and long distance moving, supplies, packing, storage and more.